Paediatric traumatic cardiac arrest is a high acuity, low frequency event. Key to the improvement in survival observed in the adult population has been the adoption of an aggressive and standardised approach to resuscitation in victims of traumatic cardiac arrest. There is currently a lack of consensus as to the optimum management of the paediatric patient in traumatic cardiac arrest, with no standardised approach available. Based on a previously reported Delphi study, this paper provides the first consensus-based algorithm for the management of paediatric traumatic cardiac arrest. By providing this algorithm, we believe that a standardised and aggressive approach can be undertaken in major trauma centres and in trauma units. In 2013, both Lockey and Sherren published guidelines for the management of TCA in adults within their respective organisations (London’s Air Ambulance and Sydney HEMS), describing the evidence-based rationale for the approaches contained within.8 9 Subsequently in 2015 and 2017, both the European and UK Resuscitation Councils published TCA treatment algorithms for adults to inform clinical priorities and intervention.5 However, there is currently no accepted national or international guidance specific to children in TCA. With a paucity of evidence surrounding the management of paediatric TCA and with the majority of clinicians only having limited experience, we undertook a programme of work to derive expert consensus opinion to define the optimum management of paediatric TCA and construct an algorithm to guide clinical practice. Blunt and penetrating trauma should be treated differently. Absent palpable pulses or no signs of life should trigger a paediatric TCA algorithm. The absence of cardiac activity on ultrasound should trigger a paediatric TCA algorithm. Whole blood therapy improves survival. Rapid volume replacement improves survival. Thoracotomy in penetrating trauma improves survival. Pericardiocentesis should not be performed in paediatric TCA. Ensuring oxygenation (via an endotracheal tube or supraglottic device) improves survival. Providing ventilatory support improves survival. Duration of arrest in paediatric TCA is helpful in determining the futility of continued resuscitation. The lack of response to any intervention is helpful in determining the futility of continued resuscitation. If all invasive procedures have been completed and there is no return of spontaneous circulation, this is helpful in determining the futility of continued resuscitation. Cardiac standstill on ultrasound is helpful in determining the futility of continued resuscitation, in the presence of appropriate resources and a trained operator. In this element of the development package, we aimed to: (1) explore the statements not reaching consensus during the online Delphi phase and (2) incorporate the consensus from both phases to develop a national standardised TCA algorithm for the paediatric patient (defined as a patient aged 0–16 years in keeping with previous studies). As an open forum, participants (n=41) were not blinded to one another. The initial part of the conference involved the presentation of existing evidence in the form of topic-specific systematic reviews. The second part of the meeting was dedicated to exploring statements that did not reach consensus during the Delphi process.10 Nineteen questions relating to the definition, diagnosis management and termination of resuscitation of paediatric TCA were given to the participants to discuss in small groups of between five and seven participants. After 5 minutes, key points from the discussions were presented from each small group to all participants. Subsequently, each individual participant was asked to vote on their agreement with the statement in question using electronic voting devices, by voting ‘yes’, ‘no’ or ‘don’t know’. Participants were not blinded to one another, but the use of the individual electronic voting devices allowed for anonymous voting. The study team facilitated the discussions and presented the questions but did not take part in the voting process. Consensus was set a priori at 70% of the total number of participants responding to each statement. This process was repeated for each statement with a single round of voting conducted for each statement. For standardisation of responses, those not recording a vote for a statement were included in the ‘don’t know’ category. Results were collated using a Microsoft Excel spreadsheet. An algorithm was then constructed using statements reaching positive or negative consensus and based on adult TCA algorithms previously published. Statements that failed to reach consensus have not been included in the algorithm. In total, 41 individuals from a variety of backgrounds attended the consensus development meeting (table 1). The overwhelming majority of participants were consultants, mostly from paediatric emergency medicine. Responses to questions are shown in table 2, along with the number of participants responding for each statement. Of the 19 statements, 13 reached positive consensus and were included in the paediatric TCA algorithm (figure 1). The statement ‘in paediatric TCA, rescue breaths should be given at entry to the algorithm’ reached negative consensus and was therefore not included in the algorithm. Consensus was not reached for five statements. Paediatric TCA algorithm. ETCO2, end tidal carbon dioxide; PICU, paediatric intensive care unit; ROSC, return of spontaneous circulation; TCA, traumatic cardiac arrest. In keeping with adult TCA algorithms, consensus was reached regarding the initial management of paediatric TCA, with the rapid identification and simultaneous correction of hypoxia, hypovolaemia, tension pneumothorax and cardiac tamponade.8 9 18 This has been represented in the algorithm in box 1, which describes a bundle of potentially life-saving interventions that should be undertaken simultaneously by the resuscitating team. The intention is to provide one algorithm to guide management in all circumstances, but there may be occasions where not all of these interventions are appropriate, if a reversible cause can be excluded or if the situation is judged to be futile, guided by senior clinical decision makers. In the presence of a multidisciplinary trauma team, the interventions can be undertaken simultaneously, but this may be limited by the number and skills of the team. Effective oxygenation and ventilation is a key principle of trauma resuscitation, and correcting hypoxia is essential in the reversal of hypoxic cardiac arrest.5 During the Delphi process, consensus was reached that the correction of hypoxia should be optimised where possible by using an endotracheal tube or supraglottic device placed by an appropriately skilled individual in either the prehospital or hospital environment. Cardiac tamponade following penetrating trauma is well described in the adult population, and survival following thoracotomy (within 10 min of cardiac arrest) in this group of patients is as high as 18%.23 In keeping with adult recommendations, the Delphi group reached consensus favouring thoracotomy for penetrating trauma to relieve possible cardiac tamponade. There was discussion about the role of thoracotomy in blunt trauma, as it can be used to relieve tamponade, contain pulmonary bleeding and to apply aortic compression for proximal control of haemorrhage below the diaphragm.24 25 However, the group failed to reach consensus for or against thoracotomy in blunt paediatric TCA, and it is therefore presented as an option for consideration, but without clear recommendation, within the algorithm. This remains a key area for future trauma registry work. While cardiac chest compressions are recommended as the mainstay of basic life support for both adult and paediatric patients in medical cardiac arrest,26–28 in the TCA setting, cardiac chest compressions have been deprioritised in adults until potential reversible causes have been addressed.5 The consensus meeting achieved unanimous 100% agreement in the deprioritisation of chest compressions in both penetrating and blunt paediatric TCA. However, the group achieved consensus in supporting the delivery of chest compressions once interventions to address the main potentially reversible causes (hypoxia, tension pneumothorax, hypovolaemia and cardiac tamponade) have been achieved. The use of vasopressors in the context of trauma to allow catch-up with blood products is an area of controversy in adult trauma practice, with currently little or no evidence for their use and one study demonstrating potential harm from their administration.29 30 The group failed to reach positive or negative consensus on the use of vasopressors (either by bolus or infusion) before return of spontaneous circulation (ROSC) in the context of any paediatric TCA (including paediatric TCA from suspected isolated traumatic brain injury (TBI)). We acknowledge that there may be a small cohort of paediatric patients in TCA where the use of vasopressors will be required, particularly in the context of neurogenic shock combined with hypovolaemia. After ROSC from paediatric TCA, the group failed to achieve consensus regarding the use of vasopressors except in the context of those patients with isolated TBI, in which case a blood pressure should be maintained at a level sufficient to provide neuroprotection but balancing this against the risk of destabilising other injuries (including clot formation). The group supported the deprioritisation of defibrillation of a shockable rhythm in the setting of paediatric TCA while other reversible causes were addressed (see suggested algorithm). Once reversible causes have been addressed, the group supported defibrillation in such circumstances where a shockable rhythm is present. The cessation of resuscitation attempts in children in TCA is challenging, and recognition of features suggesting futility is important in supporting such a decision. In adult medical cardiac arrest, end tidal carbon dioxide (ETCO2) has been used to determine the futility of continued resuscitation.31 32 While we are unaware of similar studies in either the paediatric population or TCA cohort, the group agreed that the use of ETCO2 may be useful in determining the futility of ongoing resuscitation. Reaching the end of the suggested algorithm without ROSC was also discussed as a marker of futility and a point at which further resuscitation efforts may be withdrawn. The main limitation for this study is that the algorithm was by necessity based on consensus rather than robust clinical evidence. The lack of evidence suggests that future research is needed to answer some of these research questions. In the meantime, it is hoped that reaching consensus on at least some aspects of the recognition and management of patients in TCA will provide a useful framework on which clinicians might base their management. Within the UK, paediatric TCA is a high acuity, low frequency event. In attempt to standardise our approach to its management and to improve outcomes, we present the first consensus-based algorithm specific to the paediatric trauma population. This may be applicable to similar healthcare systems internationally. Roger Alcock, Dawn Ball, Mark Beasley, Sophie Butterworth, Sam Cooper, Phil Cowburn, Darren Darby, Kerry Davis, Peter Davis, Alice Downes, Naomi Edmonds, Laura Fallon, Andrew Fitzsimmons, Kunal Gadhvi, Chris Gough, Stuart Hartshorn, Giles Haythornthwaite, Ali Husain, Andras Husz, Hayley Jarman, Graham Johnson, Damian Keene, Suzie Kellett, Miki Lazner, Liz Ledger, Caroline Leech, Danielle Leemon, Gareth Lewis, Julie-Ann Maney, Jon McCormack, Kat Moore, Dan Nevin, Breda O’Neill, Clare O’Connell, Rebecca Powell, Sarah Prudhoe, Gisela Robinson, Elizabeth Saunders, Barney Scholefield, Karl Thies, Tom Waterfield and Bridget Wilson. Advanced Life Support Group. Advanced Paediatric Life Support a practical approach to emergencies. 6th edn. West Sussex: Wiley, 2016. Resuscitation Council (UK). 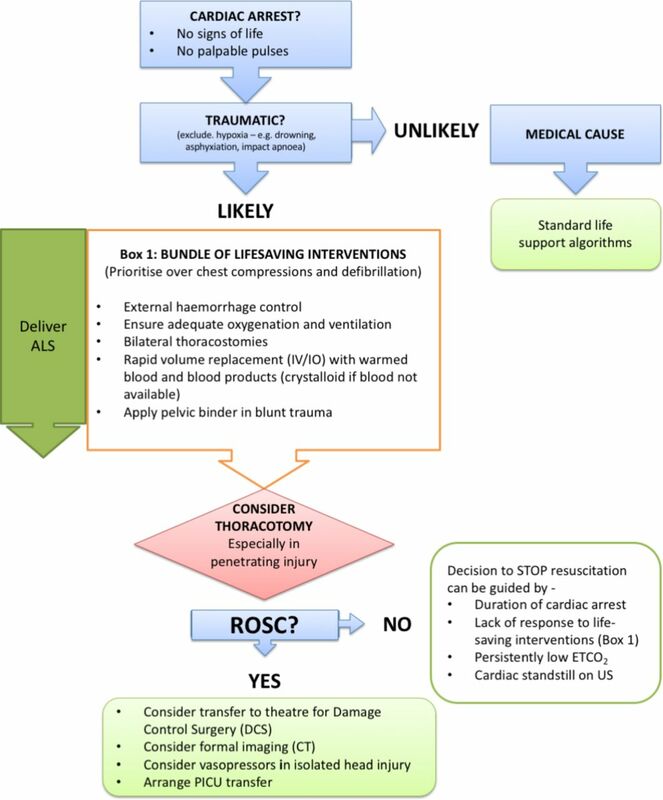 Traumatic cardiac arrest treatment algorithm 2015. 2018 https://www.resus.org.uk/EasySiteWeb/GatewayLink.aspx?alId=6464 (accessed 16 Mar 2018).